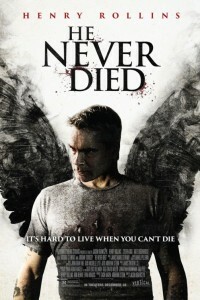 In the movie He Never Died Jack (Henry Rollins) is in a rut. His existence has been whittled down to sleeping and watching TV, and he sees the human race as little more than meat with a pulse. When Jack suddenly finds his long-lost daughter taken by the city’s crime syndicate, he must combat his inner demons as he embarks on a bloody war path to seek revenge and save her.